The Lord has said, “Whoso layeth down his life in my cause, for my name’s sake, shall find it again, even life eternal” (D&C 98:13). It is well known that Joseph and Hyrum Smith became martyrs of truth as they were killed in the cause of Zion. But what about the many others who likewise became martyrs? Here we will briefly examine those individuals who gave their very lives for the truth of the restored gospel. Samuel Smith was the younger brother of Joseph Smith, one of the eight witnesses of the Book of Mormon, called as the first missionary in this dispensation, and a devoted member of the Church throughout his life. The following account is from Church History, notably B.H. Roberts: “On June 27, 1844, while still living in Plymouth, Samuel learned that his brothers Joseph and Hyrum, who were in Carthage Jail with John Taylor and Willard Richards, were in danger. Samuel headed toward Carthage with a 14-year-old boy driving a wagon. On the way they met a mob, which attacked when they learned Samuel was Joseph Smith’s brother. The boy headed to Carthage with the wagon, and Samuel escaped into the woods “after severe fatigue, and much danger.” He made his way home and “acquired a horse noted for its speed.” His six-year-old daughter, Mary, remembers this moment: “My father came into the house in much excitement, and said … ‘I think I can break through the mob and get to Carthage’ and immediately he mounted the horse and was gone.” As he neared the town, a man and woman escaping in a buggy told him his brothers had been killed. Samuel rode on at great speed. Some of the mob, expecting his return, had hidden in a thicket. They chased Samuel, shooting at him. A bullet passed through the top of his hat, but Samuel, an excellent horseman, outran them. Samuel was the first Latter-day Saint to arrive at the jail, but by then Joseph and Hyrum were already dead. The violence was over, the mob had retreated, and Samuel had a piercing pain in his side. Samuel helped Willard Richards take the two bodies and the severely wounded John Taylor to a nearby hotel owned by Artois Hamilton. That night Willard wrote a letter to Emma telling her that Joseph and Hyrum were dead. Samuel’s signature appears alongside that of Willard Richards and John Taylor. The next day, Samuel, Willard, and Artois took the bodies of Joseph and Hyrum in two wagons to the Mansion House in Nauvoo. Samuel drove the wagon carrying the body of his brother Joseph. A guard of eight men accompanied them. After Lucy viewed the bodies, Samuel said, “Mother, I have had a dreadful distress in my side ever since I was chased by the mob.” Though Samuel was in pain and Levira was only weeks away from delivering a baby, the family moved into a two-story frame house opposite the Mansion House. Samuel’s health continued to decline. On July 30, just 34 days after Joseph and Hyrum died, Samuel died. His young daughter Mary remembered how “silence gave way to sobs” after their father passed away. His cause of death was listed as bilious fever.” The official cause of death was bilious fever, which is a disease accompanied by a fever and the evacuation of bile, such as typhoid fever or malaria. Samuel’s mother, Lucy Mack Smith, later suggested that Samuel had become ill because of the fatigue and shock experienced by the death of his brothers. Samuel was 36 years old. Parley P. Pratt was called as one of the Original Twelve Apostles of this dispensation in 1835 at the age of 27. He spent the remainder of his life serving faithfully in that capacity as well as many missions across North and South America and Europe. Elder Pratt was called as one of the few leaders to enter into the practice of polygamy. In doing so, Elder Pratt was blessed with 12 wives, 30 children, and 266 grandchildren (today there are nearly 50,000 living descendants which include several prominent members of the Church and society). In 1855, Elder Pratt married Eleanor McClean, whom he had met while presiding over a mission in San Fransisco, California. A recent convert, Eleanor had been previously married to an abusive alcoholic who did not approve of the LDS church nor her new marriage. Because of the abusive state she found herself in and that of her children, Parley and Eleanor found it best to take custody of her children and move to Utah. While Elder Pratt was serving a mission in the eastern states, Eleanor went to New Orleans to get her children. Because Eleanor took the children, Hector, Eleanor’s ex-husband, blamed Pratt. Hector pressed criminal charges and when the Judge sympathized with Eleanor and Pratt, Hector and two friends sought to track Pratt. Searching across Texas, Oklahoma, and Arkansas, Hector would find Pratt in Arkansas while on a proselyting mission. On May 13, 1857, Pratt was shot and stabbed* by Hector on a farm northeast of Van Buren, Arkansas. As Elder Pratt was bleeding to death, a farmer asked what he had done to provoke the attack. Pratt said, “He accused me of taking his wife and children. I did not do it. They were opporessed, and I did for them what I would do for the oppressed any where.” Elder Pratt later died two and a half hours later from blood loss. 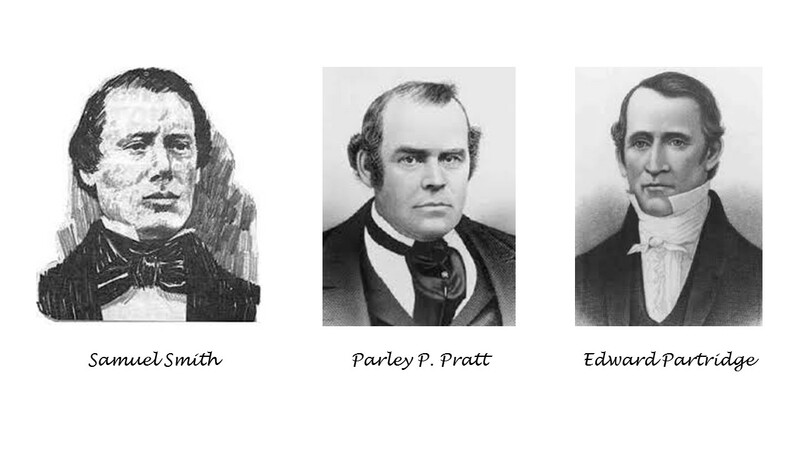 Brigham Young would later compare Pratt’s death to that of Joseph and Hyrum Smith. Parley was 50 years old. David W. Patten, one of the original members of the Quorum of the Twelve Apostles, earned the nickname among saints, “Captain Fear Not” for being valiant and courageous time after time in defending the saints against persecution and injustice. He later would die from wounds received in the Battle of Crooked River in 1838. This battle ensued when a group of men from the Missouri state militia abducted three Mormon men. In response, Elder Patten, serving as commander of the Mormon militia, led a group to rescue these men. On the morning of October 25, 1838, the Mormon militia approached the ford where the state militia were camped. Shots were immediately fired and Patten thus ordered a charge against the attack crying “God and Liberty!”. The three men kidnapped by the state militia were rescued, however Patten was shot in the bowels and later died. Joseph Smith would say of David W. Patten, “There lies a man who has done just as he said he would – he has laid down his life for his friends.” It was also said of Elder Patten that, “Wherever assistance or defense was needed, Apostle David W. Patten was to the rescue among the foremost… In his presence the oppressed found a champion, and at his approach the wicked were filled with terror.” David was 38 years old. *Pratt’s violet death may have played a part in the events leading up to the Mountain Meadows Massacre a few months later.